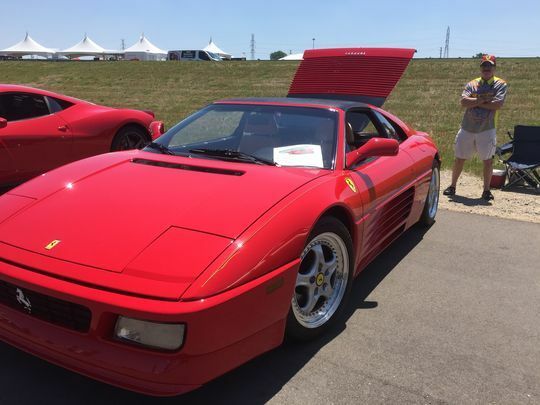 Italian sports cars lovers found a piece of heaven in Pontiac on Sunday when hundreds of Ferraris, Alfa Romeos and Maseratis packed the M1 Concourse for the largest “Italian Happening” car show and festival in years. More than 6,000 people came for the event, which previously had been held at the Concours d’Elegance of America car show. This year, the event was at the M1 Concourse in an expanded format. Visitors marveled at the more than 300 exotic cars on display and had a chance to test-drive one of four 2017 Alfa Romeo Giulias around the M1 track. Several festival-goers remarked how they had never before seen so many Ferrari supercars in one place. At least 60 Ferraris were on display. “It’s incredible just seeing them all together,” said Nick Anderson 23, of Detroit, who was particularly thrilled to glimpse a rare Enzo Ferrari, a car named for Ferrari’s late founder and first produced in 2002. Leigh-Monstevens said that Sellers’ old Ferrari, now red in color, was originally white. Alfa Romeo is a Fiat Chrysler Automobiles brand that is more than a century old. Alfa Romeo stopped selling cars in the U.S. in the mid-1990s, finally returning two years ago with its 4C roadster. This year marked Alfa Romeo’s broader return to the North American market with its entirely new Giulia, with a base price starting at $37,900. There was a long line Sunday to test-drive a Giulia around the M1 track. The 1.5-mile spin was free of charge, but with the festival’s wine-tasting tent in proximity, drivers had to pass a Breathalyzer test before getting behind the wheel and could blow no higher than 0.00%. Maggie Goldman, 49, of Bloomfield Hills was impressed by how well the blue Giulia that she tested handled the M1 Concourse’s performance track. “It had great acceleration and it took the turns very easily,” she said. Joe Pistono, 63, of Sterling Heights was among the car owners who brought out their Italian vehicles for display. Pistono said he is the second owner of his 1991 Ferrari 348TS, which be bought in 1999. There were 13,000 miles on the car when he acquired it; today it has about 19,000, he said. His low annual mileage qualifies him for a special limited-use auto insurance deal: just $600 a year. Even at that speed, the car was surprisingly stable. But it’s neither fast nor easy to catch a new 2017 Ferrari. Sieglinde Espenshade, a saleswoman at Cauley Ferrari in West Bloomfield, the only Ferrari dealership in Michigan, said there is about a six-month wait between ordering a new Ferrari and its delivery. The lowest base price for a new model right now is $202,500. “It’s all bespoke (made to order) and you are waiting for it to be manufactured in Italy,” she said.